the oldest piece of space junk still orbiting the Earth is the satellite Vanguard I. 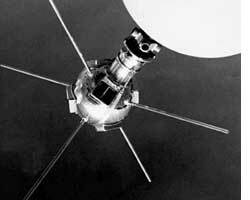 In 1958, it became the fourth artificial satellite launched--and the first powered by silicon solar cells. In the 50 years since, the efficiency of solar cells for space has more than doubled, because their development is based solely on performance; space budgets tend not to be swayed by minor concerns like inflation or declining incomes. The same, though, cannot be said about solar cells used on terra firma: they are quite similar to those on Vanguard I.
Unlubricated by space-scale budgets, solar cells on earth are used in homes and offices; they need to be affordable. But the maximum efficiency of a cheap solar cell--the amount of solar light it can convert into electricity--is 25 per cent. Three-fourths of the energy in sunlight is not converted. For consumers, it translates into a large number of solar cells to make a small amount of power. This has to do with how light energizes the atoms of a material like silicon, making them lose electrons. But they stay loose for a tiny fraction of a second before going to rest in the atom. There is only a small window of opportunity for charge separation: to capture the philandering electrons. This process is called fluorescence, and it lasts only as long as the sunlight excites the material. Scientists across the world are trying various methods--from dyes that improve the conversion of sunlight into power to several approaches to create new, more efficient materials--to make solar cells produce more power for less investment. Chemists of Ohio State University in the us have created a hybrid material that not only absorbs all the energy in sunlight, but also makes the electrons easier to tap. It will take years to develop the material commercially, but their experiment is a proof of the concept, said Malcolm Chisholm, chair of the chemistry department at the university. He is one of the authors of the paper published in Proceedings of the National Academy of Sciences. "There are other such hybrids out there, but the advantage of our material is that we can cover the entire range of the solar spectrum," he said. The material is a hybrid of electrically conductive plastic with metals like titanium, the strongest known metal, and molybdenum, which has a high melting point. The development of the material was a two-step process. The group first explored different molecules on a computer and then synthesized them in a lab. At this stage, material was liquid. When the material was exposed to light and its qualities studied, the group found that unlike other materials that just fluoresced, this material phosphoresced too. This means it continued to radiate light even after the source of light was removed. For the solar cell, this means that the electrons remained in the excited state for longer and available for capture. The electrons had more energy: while those emitted by regular solar cells remained free for up to 12 picoseconds, the electrons released by the new material stayed free 7 million times longer. The best thing was that when the molecules were deposited in a thin film to use in solar cells, the triplet state lasted for 200 microseconds.